The FT-4XR & FT-4VR Mini-Manual covers all the features for both single and dual band versions of this transceiver. Mini-manual size, 4.5x8 inches. Twelve high-quality laminated pages. 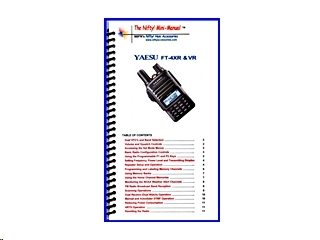 This is an ideal short-form guide for setting-up and operating all the capabilities of these two radios. Includes procedures for the all operations described in both the basic and advanced factory manuals.